The last official day of Carnival 2017 will see blocos throughout the city of Rio, with yet more unofficial blocos set to take place during the day and throughout the week. RIO DE JANEIRO, BRAZIL – In the last official day of 2017’s Carnival celebrations, 81 blocos will take place throughout Rio de Janeiro today. With blocos of all sizes and types happening all across the city, Cariocas and tourists alike will take the opportunity to enjoy the final day’s festivities. Bloco Rio Maracatu wil take place later today in Ipanema, photo internet recreation. Some of the biggest and most popular blocos are spreading through the city today, with ‘Carmelitas’ returning to Santa Teresa’s Largo do Curvelo this morning. Also in Santa Teresa, bloco ‘Cheiro na Testa‘ will be in Largo dos Guimarães from 11AM, while ‘Cardosão de Laranjeiras‘ will start at around the same time in Laranjeiras. The majority of today’s blocos will take place this afternoon, with 63 scheduled to start after midday. Among the most popular are ‘Orquestra Voadora‘, starting in Glória from 3PM, plus ‘Empurra que Pega do Leblon’ from 4PM and ‘Banda de Ipanema’ at 5PM, in Leblon and Ipanema respectively. 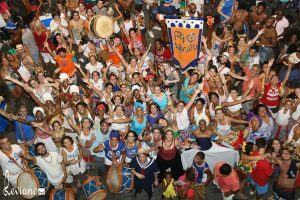 Also in Ipanema, bloco ‘Rio Maracatu‘ will start from 2PM, while popular bloco ‘É Tudo ou Nada!! ?‘ kicks off in Humaitá at 1PM and Jardim Botânico hosts a vegan bloco from 2PM. The later official blocos today will take place in the city’s Zona Norte (North Zone) and Zona Oeste (West Zone). The day’s six final blocos, smaller in size, include ‘Raízes da Vila da Penha’ and ‘Confetes e Serpentinas’, starting from 6PM and all wrapping up before midnight. While today marks the end of official Carnival celebrations in Rio de Janeiro, unofficial blocos will continue during the week. Diverse blocos are set to take place over the next few days, including ‘Batuque das Meninas’ tomorrow in Largo do Machado and ‘Filhos da PUC’ in Gávea, while Glória’s ‘Me Beija que Eu Votei no Freixo’ (‘Kiss Me Because I Voted for Freixo’) is one of several planned for Friday evening.